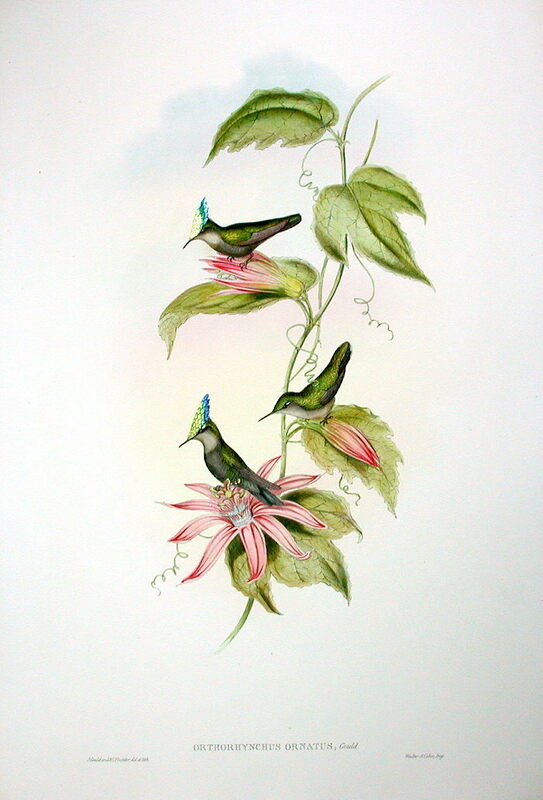 ‘A superb ORIGINAL hand-colored lithograph of hummingbirds from “John Gould’s Monograph of the Trochilidae, or Family of Hummingbirds”, published from 1849-1861. John Gould was a self-taught English naturalist, gifted artist, & talented taxidermist. A man of vision, with a talent for organization and administration, he founded an empire for ornithological illustration, publishing more than forty large folio volumes. These works contain over 3,000 plates, all superbly drawn and meticulously hand colored. The first work appeared in 1831 and the last in 1888, seven years after Gould’s death. His was a true Horatio Alger story, beginning with humble origins as the son of a gardener. He learned taxidermy at an early age, becoming a taxidermist for the Zoological Society of London in 1827. During this same year he married Elizabeth Coxen, who embraced his ambitions ardently and can be credited with much of his success. Though Gould sketched the outline designs of every plate himself, many of the finished drawings, transfers to lithographic stone & hand coloring were her work. Credit should also be given to his talented secretary Edwin Charles Prince, and the team of gifted artists assembled to complete these tremendous publications. These included E. Lear, J. Wolf, W.M. Hart & H. C. Richter. By mid life Gould was recognized as an ornithological authority and a man of science & in 1843 was elected Fellow of the Royal Society. His first work was “A Century of Birds from the Himalaya Mountains”, published in 1831. Unlike many of his peers, he was a consummate businessman and skilful marketer, so his works became very successful early on. This provided funding for his travel to far flung parts of the world such as Australia, America and New Guinea to observe and sketch the species of these countries. The inspiration for his work on hummingbirds was derived from travels in America. All of his works were very expensive at the time of publication, and could only be purchased by the very wealthy. It is estimated that only about 250 copies of the hummingbirds were produced, so these prints are a rare treasure indeed. Originally published in 25 parts with a 5 part supplement, the last three parts of the supplement were published posthumously by Sharpe. I highly recommend Panteek’s Antique Prints for the purchase of original prints. The Royal Horticultural Society also do some fine reproduction prints.